VANCOUVER, BRITISH COLUMBIA–(Marketwired – Aug. 16, 2016) – Saturn Minerals Inc. (TSX VENTURE:SMI)(FRANKFURT:SMK) (“Saturn” or the “Company”) is pleased to announce the successful acquisition of 158 sections (41,000 hectares / 410 sq.km) of Oil & Gas Special Exploration Permits (the “Permits”). 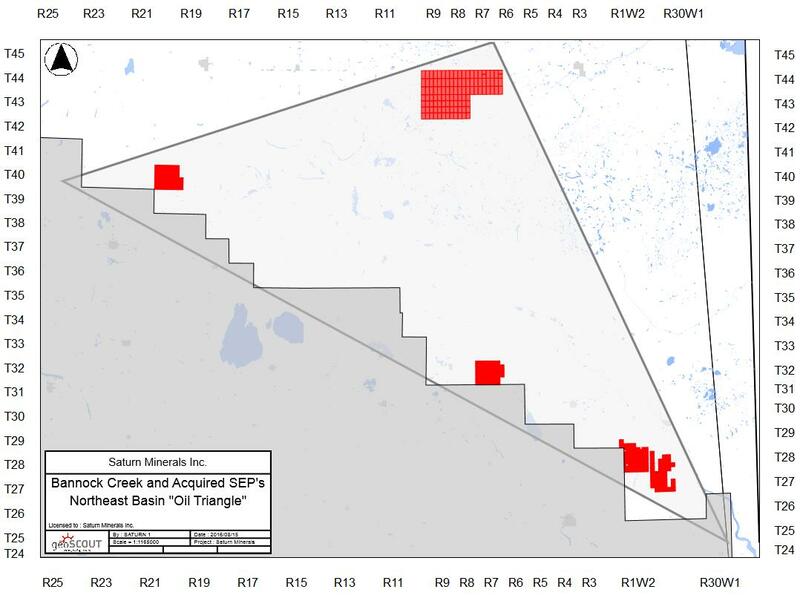 The acquisition of these additional permit areas are the result of a technical evaluation of drilling programs carried out on the Bannock Creek property which have confirmed Saturn’s exploration model of Ordovician Red River source rock with large structural traps north of the Potash Restriction Zone, in the “Oil Triangle”. These permits fall within a geographic zone situated between the towns of Humboldt, Kamsack and Hudson Bay. To view the map associated with this release, please visit: http://media3.marketwire.com/docs/1066123map.jpg. This area has never been adequately explored for economic pools of oil due to the interrupting presence of the Potash Restriction Zone. Saturn’s exploration program at Bannock Creek has outlined structural features within the Ordovician Red River formations which create traps for the known source rock. The Bannock Creek exploration model is definitive evidence that oil is pooling in this unexplored region of the province. The newly acquired Permits were selected based on Saturn’s proprietary geological knowledge and decade of experience in the “Oil Triangle” and are all located immediately adjacent to the Potash Restriction Zone. As previously mentioned, the primary target formation of Saturn Minerals exploration program continues to be the Red River Formation, a stratigraphic unit of Upper Ordovician age in the Williston Basin well known for economic pools of oil south of the Potash Restriction Zone, and unexplored north of the Potash Restriction Zone. The analogous oil pool model south Saturn is targeting is the Red River Tyvan pool which contains an estimated 60 million barrels in place with 15 million recoverable barrels of light crude 31 API oil. Saturn Minerals Inc. (TSX VENTURE:SMI)(FRANKFURT:SMK) is a junior Canadian energy company advancing a portfolio of oil and coal properties in Saskatchewan and Manitoba. The Company exclusive oil & gas rights in Saskatchewan and is advancing a number of oil exploration projects. Saturn has also made three shallow bituminous coal discoveries since 2009 with coal seams ranging in continuous vertical thickness from 9 to 89 meters. Saturn has a strategic ownership in Inowending Exploration & Development Corp., a First Nations owned exploration and development company co-founded by Saturn with a consortium of Saskatchewan First Nations active in Canada’s prairie provinces. Saturn’s mission is to be a leading industry player in the discovery and commercial production of oil & gas resources in the Northern Williston Basin. To learn more, please visit: www.saturnminerals.com.